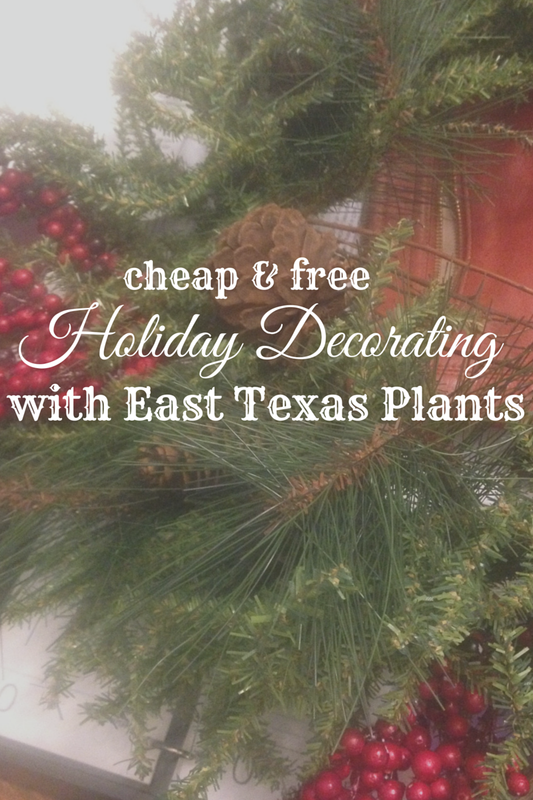 Palestine Real Estate & Palestine TX Homes For Sale | BuyPalestine.com Cheap & Free Holiday Decorating with East Tx Plants! So, I have been pulling out and dusting off my holiday decorations and I was just kind of uninspired by the same decorations that I put up year after year. I wanted a new “look” and to give an update to some of the decorations that are a bit tired. So, I started thinking about the basics. I want something green and lively and less “plastic-y.” Then, it hit me. We are lucky that we live in East Texas. Why? Well, that is a very long-winded novel full of reasons that I will save for another day! One of them, however, is that there are FREE Christmas decorations everywhere! Whoohoo! I don’t know about you, but free is my kind of price! Christmas decorations are typically composed of evergreen foliage, pine cones and berries. Well aren’t we East Texans in luck! Take a look around you, because we have it all, everywhere you look! PINE CONES – To prepare your pine cones for your decorations (if they are going inside your house), you’ll want to make sure they are free of bugs and that the sap is dried. To do this quickly, place the pine cones on a lined baking sheet and bake for approximately 30-45 minutes at 200°F. Be sure to keep an eye on them so they don’t burn (burning pine cones are probably not the holiday scent you are going for) and adjust any bake times accordingly. Once you’ve cleaned the pine cones, you can paint, bleach, add some glitter or glue them onto other elements–pine cones lend themselves to so many looks! The options are only as endless as your imagination. Lime green pine cones, white glitter pine cones, pine cones glued together to create a Christmas tree—you’ve got to love the possibilities! A fresh spin on pine cones! Check out the Full Tutorial at The Homes I Have Made Blog! GREENERY & BERRIES – From pine sprigs to boxwoods, there is greenery all around you! It doesn’t have to be “traditional” Christmas greenery–whatever textures and aromas you like (or whatever happens to be the closest plant to you when you start this project), use it! Experiment with it. Boxwoods make a great texture for a wreath with a very traditional yet updated look (and wow, Boxwood wreaths in stores are pricey!). Pine sprigs and ivy lend themselves well for mantle decorations. Don’t have time to craft homemade wreaths from boxwood clippings? Never fear, there is another way to do it and cut down on the time! Add some sprigs of live plants to your faux garlands and wreaths with floral wire to spruce them up–much faster and much less tedious. This method is great because the existing faux greenery is already there, so add as little or as much as you like (or have time for) and you’ll still get a new look! East Texas also has a variety of berries just ripe for the Christmas pickins’! The berries can be added fairly quickly to floral arrangements, wreaths, garlands and much more with a little bit of wire or glue. Keep in mind that some greenery will last longer than others once cut, so it will be a decor and science project all rolled into one. Keep an eye on the live parts of your decor and have a plan to replace any parts during the season, just in case they get a little too crispy. Huzzah! There is a use for boxwoods! Lol! Checkout this awesome DIY Tutorial for a Boxwood Wreath by Liz Marie! STICKS / BRANCHES – High end designers often use sticks and branches as the base for centerpieces at fancy parties and weddings. This is an easy style to borrow, as sticks and branches are plentiful in our neck of the woods! You can use them in their natural state or spray paint them–either way, you’ve got the beginnings of a great designer look. A few gold branches can turn your wreath from ordinary to extraordinary in a flash. There are so many other items you could use to incorporate into your decorations—pecans, crab apples, dried herbs (like rosemary sprigs), dried fruit (sliced lemons and oranges) and more. East Texas is a mecca for fantastic natural decorations. Be sure to keep safety in mind while collecting your supplies (try not to climb onto the roof to reach that perfect sprig!) and keep any berries or poisonous plants out of the reach of children and pets. The best part of using the natural elements is that you can tweak the look to your personal style. Using natural elements with traditional Christmas ribbons and bows makes an easy and custom finish. If you like a more rustic look, add some burlap or rusted metal accents. For a more glitzy mix, add shiny balls or maybe even some non-traditional elements like costume jewelry! The sky is the limit and the best part is that next year you can do something completely different without having to buy all new decor. I love a cheap fix, don’t you? Lisa E. Priest loves Christmas decorating a little too much and is an East Texas Area REALTOR® with Picket Fence Realty, Inc. You can reach her via phone or text at 903-948-3343 or email Lisa@rentpalestine.com or at BuyPalestine.com. Love this! You are quite the writer!